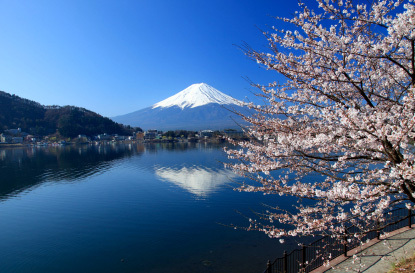 Snow-capped Mount Fuji (3,776 m / 12,388 ft) is the tallest and most famous mountain in Japan. 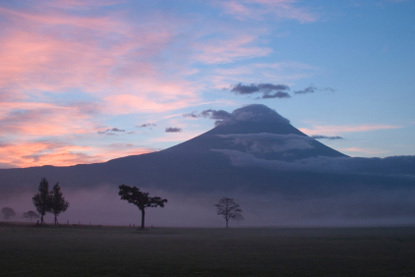 It's almost perfectly symmetrical cone shape make it one of the most beautiful volcano in the world, and an indisputable symbol of Japan. 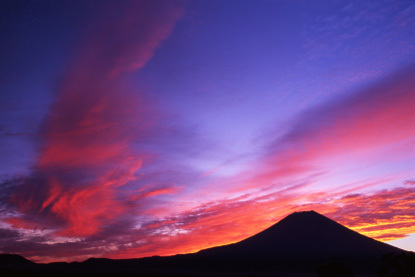 The name "Fuji" probably comes from the Ainu word for "fire" or "fiery goddess". A shrine was dedicated to the fiery goddess in 806, but that didn't prevent Fuji-san from erupting violently in 864. The fiery goddess later became the more peaceful "Konohana Sakuya Hime" or "princess of the blossoming trees". The religious importance Mount Fuji in Shintoism was such that women were banned from climbing it until 1872, when the Meiji government lifted the ban to avoid Western criticism at Japan's first World Exposition in 1877. The best views can be captured from Hakone or Gotemba, at the South-East, or from the so-called Fuji five lakes (富士五湖, fujigoko), on the North side. The 5 lakes are Yamanaka-ko, Kawaguchi-ko, Sai-ko, Shoji-ko and Motosu-ko. Yamanaka lake is the largest, but Lake Kawaguchi is arguably the best viewpoint. The best season for climbing is July and August, but it is also the most crowded. 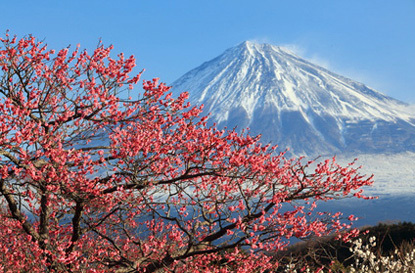 Mount Fuji can be ascended all year round, but winter months can get very cold and are only for experienced mountaineers. ‚vhenever you go, do not forget to take enough water, some snacks, suncream (UV rays are increasingly dangerous with altitude), a hat, gloves and especially warm clothes, as it can freeze at the top even on hot summer days. There are ten stations from base to summit. Climbers start ascending from one of the four "fifth stations" (Gotemba, Subashiri, Kawaguchi-ko or Fujimomiya/Mishima), which are accesible by bus or car. The five lakes can be accesed by bus or taxi from Fuji-Yoshida or Kawaguchi-ko train stations. Both stations have a youth hostel at proximity. The quickest and cheapest way, however, is by bus from Shinjuku station (about 1h45min, ￥1700). Gotemba is on the JR Gotemba line and can be accessed from Shinjuku in about 2h20min (cheapest fare = ￥1900). The easiest way to go to Hakone is by using the Odakyu line from Shinjuku (about 1h30min and ￥1000).